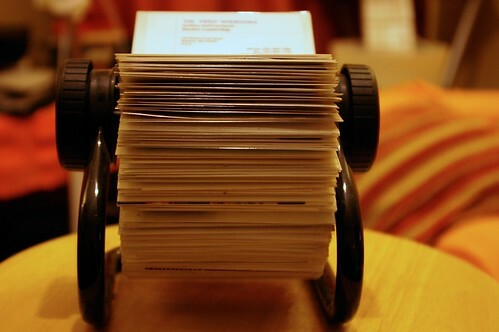 Fancy playing Business Card Roulette? So just imagine, we meet at a networking event and you proudly pass me your business card. I reach into my inside jacket pocket and pull out a bundle of assorted business cards – some slightly dog-eared and others like new – and wriggle one out from under the tightly bound elastic band. I pull a pen out of my other pocket and proceed to scribble my name, number and email address on the card. This was evidently someone else’s card that had previously been passed to me. Think of all of those business cards languishing in drawers or under desks that could be brought back into service. If you’re anything like me you will have used the business cards to connect on Linkedin and now have no need for the card itself. Business Card Roulette could hold the key to increasing the leverage from the endangered business card whilst also allowing for some random acts of kindness and serendipity. This is an idea inspired by a reference made in Blake Mycoskie’s excellent book, Start Something that Matters – Blake of TOMS Shoes fame. How’s about it? Fancy starting a [business card roulette] movement!